Gurdon Caswell builds his first paper mill on the south bank of the Black River opposite Beebee’s Island, above Cowan’s Grist Mill. The Pioneer Mill, as it was called, probably employed four or five men and as many women, and was capable of turning out 150 pounds of paper a day. Beethoven composes his Fifth Symphony. Thomas Jefferson completes his second term as President of the United States. A defeated Napoleon retreats from Russia. The Pioneer Mill and a second mill built by Caswell are sold to Seth Otis of Watertown and John C. Holbrook, presumably to settle a debt. Missouri Compromise partitions “free” and “slave” states. George W. Knowlton, a young bookkeeper, and Clarke Rice, a young printer, form a partnership to purchase the Pioneer Mill for $7,000. The business becomes known as Knowlton & Rice, a book printer and bindery. The owners collect rags for paper and deliver the finished books to area schools by horse and wagon as far north as Potsdam, NY. “Old Hickory” Andrew Jackson is elected president. Knowlton and Rice purchase machinery for making a continuous sheet of paper, known then as the Fourdrinier machine (36” cylinder). It was the first of its kind in Jefferson County. The paper capacity grows to 700 pounds per day. Samuel F.B. Morse invents the telegraph. The name Knowlton & Rice becomes synonymous with printing. Webster’s spelling books, Cobb’s Series of Spellers and Readers, Pierce’s Grammar, Ruger’s Arithmetic and the Knowlton and Rice Common Almanac are all published here. Daguerre invents first form of photography. 10-hour work days for children becomes law in Massachusetts. Fire destroys the Knowlton & Rice mill, a year before the great fire of Watertown. Losses are extensive, $16,000 for the Knowlton Mill. Gold is discovered in California. Singer patents the sewing machine. Charles Brown and Edward Chamberlain purchase the Mill for $9,000. They also assume a $13,000 10-year mortgage at 7%, payable annually. The mill changes its name to Brown & Chamberlain. Republican Party is formed for the abolition of slavery. Dred Scott decision returns fugitive slave to his “owners”. The Great Fire of Watertown on May 13th. Brown & Chamberlain default on the mortgage, and the mill is returned to the Knowlton family. Brothers George W., Jr. and John C. Knowlton, sons of the original owner, take over the business and rename it “Knowlton Brothers”. At the height of the Civil War, Abraham Lincoln issues “Emancipation Proclamation”. Robert E. Lee surrenders at Appomattox and President Lincoln is assassinated. The Watertown flood destroys much of the mill’s equipment and leads to a plant modernization, including the installation of a Fourdrinier (60” trim) paper machine with 6 dryers. Union Pacific Railroad links with Central Pacific Railroad. A new waterwheel and grinders are installed to produce wood pulp. Paper is now being made with equal portions of rags and wood pulp. The mill begins producing a cover for photographic tintypes. Knowlton begins making “standard cover” colored papers, because the Black River water had become too dirty and dark for making fine white papers. These colored papers come in 20 colors and several weights and at least two sizes, 20” x 25” and 22” x 28”. George Armstrong Custer defeated at Little Big Horn. Thomas Edison registers patent for the light bulb. Knowlton begins advertising its cover papers as Kamargo Mills Products. Kamargo is an Oneida Indian name for Black River. An automatic sprinkler system is installed and New England Mutual insures the company against fire, the first such company to be underwritten for this type of fire insurance. Louis Pasteur administers first rabies vaccination. George W. Knowlton Jr. becomes president of the new Ontario Paper Co., at Glen Park, N.Y.
George Eastman’s first camera for consumers is developed. Knowlton is the first manufacturing plant in the city to produce its own electricity. Up to that time, light was provided by kerosene. One of the mill jobs was to make sure the lamps were properly cleaned, trimmed and made ready for night. The corporation known as Knowlton Brothers, Inc. is formed and the partnership sold to the corporation for $100,000. George W. Knowlton Jr. becomes the first corporation president, a position he holds for 39 years. George W. Knowlton Jr. is named the first president of St. Regis Paper Company. William McKinley assassinated by anarchist at World’s Fair in Buffalo, NY. Wright Brothers fly for the first time. Albert Einstein proposes his Special Theory of Relativity. The company’s first duplex machine is installed for the making of a red and black duplex paper used to protect film rolls produced by the young Eastman Kodak Company. Over the next two decades, Knowlton will branch out into different lines of colored papers, including the first mimeograph paper, laminated bakelite products, dental x-ray films, and other photographic packaging paper. Some of the first Kraft paper manufactured in the U.S. is made by Knowlton Brothers’ Fourdrinier. Previously it was manufactured from Kraft pulp imported from Sweden by Charles F. Hubbs & Co. New York City. Knowlton Brothers, Inc., is awarded a contract to furnish the government with several grades of cover paper. World War I begins with Germany’s invasion of Belgium. U.S. declares war on Germany. Russian Revolution begins. Knowlton Brothers purchases the Harmon Machine Company from A.H. LaFebvre. Mr. LaFebvre reserves the right to use the plant for two years to enable him to get a new building for the business. The Great War is over, but Knowlton Brothers stands firm with other U.S. paper makers in continuing its boycott of cheaper German dyes, thus enabling the infant dye business in the U.S. to grow. Knowlton purchases adjoining property from New York Airbrake. A storehouse for rags, sulphite and other raw materials is built on the site and new boilers are installed. A new finishing room also is added to the mill, so paper does not have to be carted across the street. Women’s Right to Vote passes. Knowlton Brothers, Inc. introduces group health insurance to its employees, becoming one of the first paper companies in the country to offer this benefit. The Babe hits 60 homeruns. The Stock Market crashes, launching the Great Depression. George W. Knowlton Jr. dies shortly after turning over management of the company to his eldest son, G. Seymour Knowlton. Theodore Knowlton, Seymour’s younger brother, joins the company and seeks new areas where the existing machinery and equipment could operate profitably. This initiative launches a significant shift into industrial technical products such as latex saturated low density products. Adolph Hitler becomes German Chancellor. A Credit Union is established at Knowlton Brothers, Inc.
After a year of experimentation, Knowlton Brothers introduces a new absorbent paper that removes excess kitchen grease from foods to make them crisp and digestible. It’s made available to households in the Watertown area and sold at W. Conde Hardware Company. Low-density papers are adapted for use as oil filter media for internal combustion engines. Among many technological innovations, Knowlton develops a carbon-filled sheet which conducts electricity and can be coated for automatic reproduction of telegraph messages. Polystyrene resins introduced by Dow Chemical. Theodore, a graduate of Rensselaer Polytechnic Institute, becomes the company’s third president. Germany’s invasion of Poland starts World War II. With the onset of World War II, Knowlton’s expertise in low density papers makes possible the production of filters for gas masks. Japanese attack Pearl Harbor and U.S. declares war. Knowlton Brothers enters its first agreement with the Circle K Union (now known as the International Brotherhood of Papermakers). Knowlton Brothers is cited by the War Department as “one of the outstanding organizations supplying the Chemical Warfare Service” in World War II. Atomic bomb ends World War II. Marshall Plan quashes Communist expansion. Theodore Knowlton turns over the reins of the presidency to his son, David C. Knowlton; the family’s fourth generation to head the company. Knowlton Brothers begins routine monitoring of process water for atomic radiation – pioneering this aspect of quality control, particularly as applied to photographic papers. Knowlton Brothers becomes the first plant to make a commercial run of all-bagasse bleached paper. The pulp is from the sugar bagasse pulp mill of Valentine Pulp and Paper Co., Lockport, L.A. Under the management of President David C. Knowlton, a new pilot-size paper machine is designed for research and development. The machine is a Fourdrinier type 42 that can produce explorative paper from 12” – 18” wide. Considerable experimental work is directed toward the use of unusual natural fibers as well as synthetic fibers. Papers are made on the machine using glass, nylon, rayon, Dynel and ceramic fibers in order to evaluate their potential for production. The company invests extensively in control equipment to produce products within the very close tolerances necessary to meet customer requirements. An auto in every driveway, America tunes into TV and radio goes hip-hop. Sputnik launches the space age. Knowlton installs a flocculating tank outside its Black River factory to eliminate radioactive particles from its water supply. This tank is used for the photographic backing paper made for Polaroid, Ansco and Kodak. An air filtering system also is installed, enabling rapid changeover from one to another color or type of paper without contamination, or waste, caused by mixing different kinds of pulp. A new research program is underway to find uses for a new stretchable paper in the specialty paper field. The new extensible paper is used mainly for paper bags to hold heavy powders such as lime, cement and fertilizers, and stretches rather than breaks when dropped. When most paper mills are closing in northern New York, Knowlton Brothers is concentrating on specialty papers that are too complicated for big machines to manufacture. The machine’s flexibility allows Knowlton to change products and markets as technology evolves. Franklin D. Cean joins Knowlton. Knowlton Brothers purchases Southern Specialty Paper Co. located in Chattanooga, TN. This company had previously entered the field of filter paper manufacturing and was an ideal complement to the Watertown facility. Vietnam War protests amid race riots in many American cities. The merger of Knowlton Brothers Inc. of Watertown and Eaton- Dikeman Company, Mount Holly Springs, PA is announced. David C. Knowlton remains as President and Eaton-Dikeman becomes a subsidiary of Knowlton Brothers. The newly acquired firm concentrates on the manufacture of filter papers for the food, chemical, beverage and pharmaceutical industries. After a thorough survey of potential and existing markets Knowlton Brothers purchases land in Madisonville, KY. Construction begins on a new mill at the site. The company installs a new closed system waste treatment plant. The closed system uses wastewater which is clarified and reused in the papermaking process. Water from the Black River is added to compensate for evaporation and spillage. The new system enables the plant to use 500,000 gallons of water a day in production of special industrial papers and function for an entire week on the recycled water. The dewatered sludge is collected and removed daily for deposit at the city landfill. Knowlton Brothers announces the opening of its new plant in Madisonville, KY. This new mill includes a 130 inch Fourdrinier, the largest paper machine in the world devoted exclusively to the production of impregnated filter paper. Richard Nixon resigns amid Watergate scandal. Severe economic conditions affect the paper industry. Local 1450 of the United Papers International Union’s contract expires and a strike at the Watertown plant brings peaceful demonstrators and a federal mediator to settle the 18-day walkout. The agreement includes an eight percent wage adjustment, job adjustments and clarification of seniority issues. Rise of feminism and ecology. Civilians try to climb the wall of the U.S. embassy when South Vietnam surrenders to the North. Knowlton Brothers purchases Southern Cellulose Products, Inc. located in Chattanooga, TN, next to its Southern Specialty Division. The new division is a leading manufacturer of cotton linter pulp for the paper industry. Iranian Revolution and hostagetaking at the U.S. Embassy in Tehran. CD’s, VCR and cable TV become common place. Three entities are merged into Knowlton Brothers which are later renamed Filtration Sciences. Franklin D. Cean purchases the former Knowlton Brothers, Inc. Watertown, NY mill from Filtration Sciences Corporation. The company’s name is changed to Knowlton Specialty Papers, Inc. and the Watertown mill is operated as a completely independent entity. Soviets lose in Afghanistan and the Red Bloc unravels. Japan becomes world’s largest automaker. Internet expands with the World Wide Web. A new boiler is installed, fueled by vapors from the resins used at the Knowlton mill. The boiler replaces an incinerator that was burning an off-gassed air steam from the saturator division. It also replaces a boiler that was fired by natural gas and oil, which generated about half as much steam as the new boiler. Knowlton applies to economic development agencies for $3.825 million in financing to add a second paper machine, allowing the company to expand its manufacturing capability from single-layered to multi-layered composite materials. NASA lands the Pathfinder spacecraft on Mars. Jefferson County Industrial Development Agency approves a $300,000 loan for a water-based saturator, allowing Knowlton to use an environmentally friendly process to expand into new markets. The mill also replaces its single-walled chemical storage tanks with new double-walled tanks with spill prevention monitoring equipment. Knowlton achieves registration to QS-9000:1998 quality standard. 9/11 terror attacks alert Americans as U.S. invades Afghanistan. Disaster strikes Knowlton when a fire at its Watertown mill kills one worker and injures several more. The mechanical failure disrupts operations at the saturator plant for five months. The management team begins repairs to bring operations back on line. However, insurers dispute the approximately, $7.5 million dollar claim. The company doesn’t lose a single customer during this time: A testimony to their relationships and Knowlton’s workers. The company hires a turnaround firm to help stabilize the core business. Unpaid contractors reject Knowlton’s proposed solutions and try to force the company into involuntary Chapter 7. Knowlton Specialty Papers successfully converts this filing to a voluntary Chapter 11 Reorganization. This allows management to take the steps necessary to file an acceptable recovery plan. The plan as adopted provides for 100% payout to all creditors. China emerges as an economic giant. To better serve current and future customer needs, Knowlton receives registration to ISO:9001:2000 and ISO/TS 16949:2002 Quality Standards. 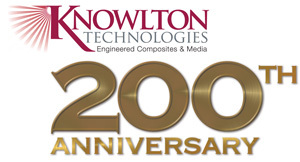 Frank Cean celebrates 20 years as owner of Knowlton Specialty Papers, Inc. Knowlton becomes a dba, Knowlton Technologies, to better fit the company profile of providing Wet-laid non-woven composites and media in the marketplace. A new marketing identity is launched. For the first time in American history, a woman and an African American vie for their party’s nomination to run for president of the United States. As we go to press, a Knowlton management group led by Frederick “Rick” Rudmann, James “Jamie” Ganter and James “Jamie” Lee are negotiating a management buyout of Knowlton Specialty Papers, Inc.
Knowlton celebrates its 200-year anniversary as the longest continuously- operated paper mill in the United States. Frank Cean and the 100 dedicated employees of the “Pioneer” mill pay tribute to the determined spirit of those who persevered and prospered through the first 200 years. We are proud of our upstate New York heritage. We dedicate ourselves to the next 200 years as the “Pioneer” technology manufacturer in emerging markets and products.